As I was unable to fully identify the source of an oil leak somewhere around the flywheel area of the RP engine I decided to fit proper oil seals on both the input and output shafts of the gearbox. Some of the very late gearboxes had an oil seal built into the rear housing which is a much larger housing than the earlier one. If you have, or can find, one then that is a job saved, however, if you are like me and don’t have one then this could be the answer. A careful examination of the front shaft revealed that by simply removing the housing from around the input shaft a small oil seal could be used by machining away the static scroll and opening up the front end of the housing to a suitable bore to fit an oil seal. I used metric oil seals mainly because I was able to source a seal with the inner bore of 28mm which was a nice snug fit on the input shaft, with a 38mm outer diameter which meant that I did not remove too much material from the housing and that were only 7mm deep. I set up the housing in my lathe, turned out a new housing for the oil seal, pressed it in and the job was done. It was as simple as that. 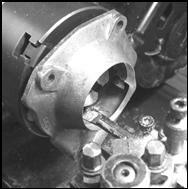 The rear bearing housing was a little more tricky as there is less material in the housing to play with. I ended up with an oil seal 35mm bore, 50mm outer diameter and 7mm wide, this seal also incorporated a dust shield lip. The pictures show quite an amount of the original casing is machined away but once the seal is pressed into place all is well. I am sure these seals will be an improvement on the old method. This article, written by Malcolm Watts, originally appeared in CA7C Seven Focus in Apr 2007 pp16-17.